Home Premier Windows launch new website with G15 Award Winning PVC-U Window and Door Manufacturer, Emplas Windows Systems. Premier Windows launch new website with G15 Award Winning PVC-U Window and Door Manufacturer, Emplas Windows Systems. Gary Warby, Director of Premier Windows, spoke of his delight at the launch of the new Premier Windows website. The website features professional photography of actual Premier Windows installations whilst incorporating the very latest “Google Friendly” technology. 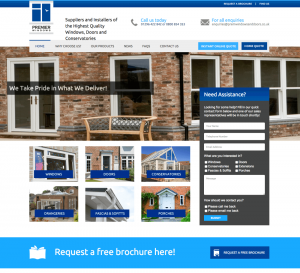 “We are absolutely delighted to have picked Emplas Window Systems to develop our new website. We are very proud of our installation prowess, and the job we do for our customers, so we are particularly happy that we can show many of these examples on our website. We also hope that the technology within the website enables more of our customers, and potential customers to see and therefore appreciate the quality of our installations. In turn, we hope that if visitors to the site are attracted the quality of our Windows, Doors, Conservatories and Guttering are have the confidence to choose our long standing family business as their number 1 choice”.